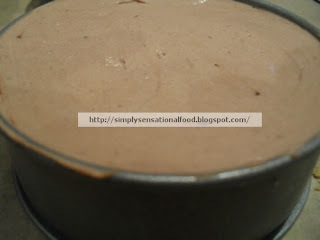 Chocolate-Vanilla cheesecake- A chocolate lovers heaven. A biscuit based no cook cake , layered with creamy chocolate and vanilla flavoured cream cheese toppings.Delicately dusted with fine cocoa powder,simply melts in the mouth with every mouthful. Served chilled with vanilla icecream and cream. 1. Butter and line 4 individual loose-bottomed tin with baking parchment. 2. Put the biscuits in a plastic food bag and crush to crumbs using a rolling pin. 3. Transfer the crumbs to a bowl, then pour over the melted butter. 4. Mix thoroughly until the crumbs are completely coated. Transfer them into the prepared tin and press firmly down into the base to create an even layer. 5. Chill in the fridge for 1 hour to set firmly. 6. In a bowl add the cream cheese, the cream, the vanilla essence and the icing sugar . 7. Whisk thoroughly till its thick, smooth and creamy . Remove 1/3 of the mixture in a separate bowl. This is the vanilla part of the filling. Keep aside in fridge until ready to use. 8. Sieve the cocoa powder, to remove lumps and add to the 2/3 cream cheese mixture .Mix till cocoa is blended in, this is the chocolate part of the filling. 9. Now spoon the chocolate cream cheese mixture onto the chilled biscuit base, working from the edges inwards and making sure that there are no air bubbles. 10. Smooth the top of the cheesecake down with the back of a dessert spoon or spatula. 11. Leave to set in the fridge for 1 hour. 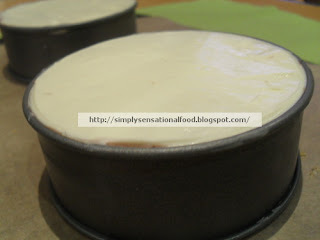 14.Remove cheesecake from fridge and bring the cheesecake to room temperature, about 30 minutes before serving. 15. To un-mould, place the base on top of a can, and then gradually pull the sides of the tin down. Slip the cake onto a serving plate, removing the lining paper and base. 16. Dust the top of the cheese cake with cocoa powder. 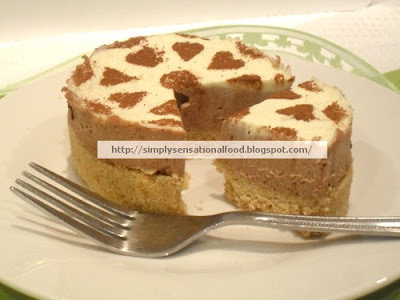 (You can form a pattern on the top of the cheesecake by covering with a paper doily before dusting with cocoa. Serve with Vanilla ice cream or just cream. You may like strawberry cheesecake. Indian vegetarian kitchen Cakes and cookies event. Gourmet Affair- Served with love event. Apy Cooking-No bake cake event. Gorgeous cheesecake, looks awesome and fantastic.. Wonderful cheesecake...Will try one day.Thanks for sharing..First time here......will be back often. u seems to be a totat lover of food.wondeful way of exploring cuisines...thnx for dropping by!!! Cheese cake looks super delicious. I love cheesecakes of any kind..This is yummy. This looks delicious! My hubby would love this dessert. Thanks for sharing! Visiting from MBC and following you now! Oh yes I'll have some please. I love cheescake. Your blog is great. The photo's really help. Though it took my computer a minuter to get everything downloaded. It's old. I'll have to try some of your recipes. awesome cake and nice presentation as well....thanks for the entry. wow..lovely cheese cake..love the presentation.. This looks soooo naughty but nice! I made this and it was lovely! Thanks! That's a very impressive cheesecake. I love cheesecake and I think it's lovely as a pudding served with cream or icecream. Garden salad with Italian herb dressing. Apple and Sesame fillo pastry parcels. Stir fried noodles with baby corn and carrots.